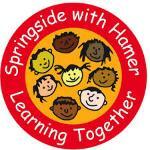 Breakfast Club is managed by the school and staffed by school staff members, it is for the pupils of Hamer Community Primary school only. The club has a fixed cost per day, which includes unlimited breakfast and activities. The cost does not change depending on the time you arrive.